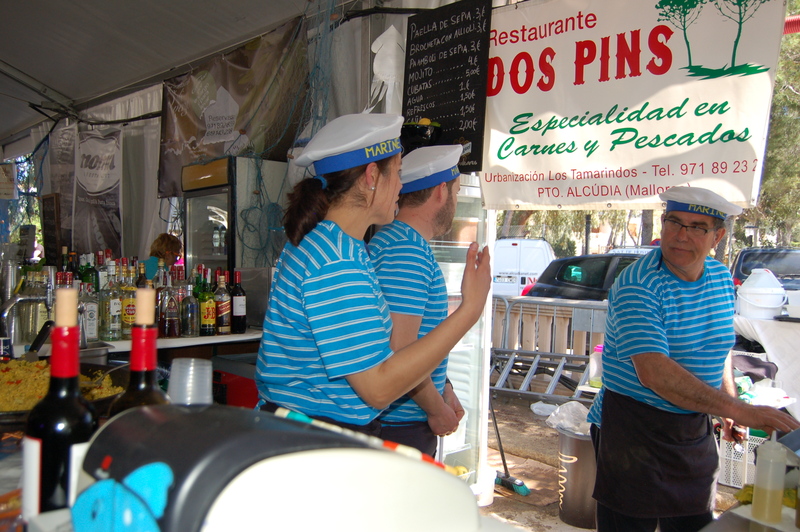 Foodies will find plenty to enjoy on Mallorca, including fairs – firas – dedicated to specific types of food or drink. 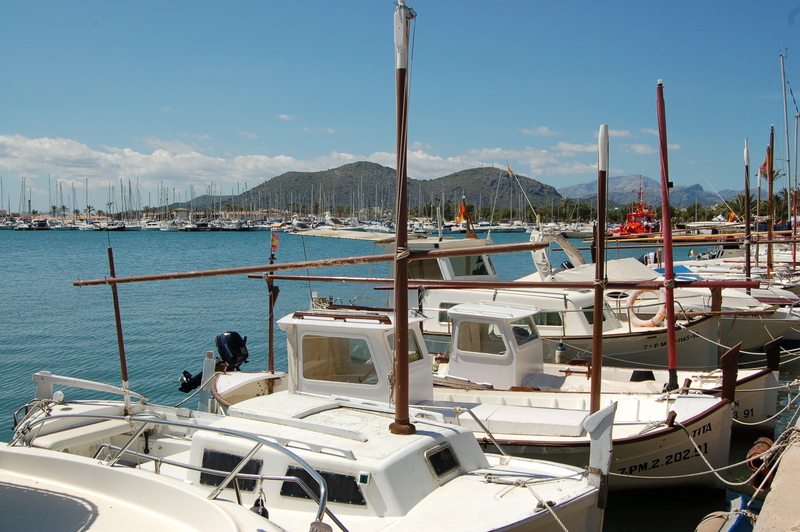 On Sunday we headed to Puerto Alcúdia for the annual Fira de la Sípia – the cuttlefish fair – which was combined with an exhibition of all-things-nautical. As much as The Boss and I would probably love to spend time drifting around the Med in a gleaming white boat, it isn’t going to happen. Far too expensive. So we cast only cursory glances at the odd outboard motor, jet ski (even those are beyond our budget), and diving gear, as we passed the various exhibitors. We were following our noses in search of the sípia tapas that we’d come for. 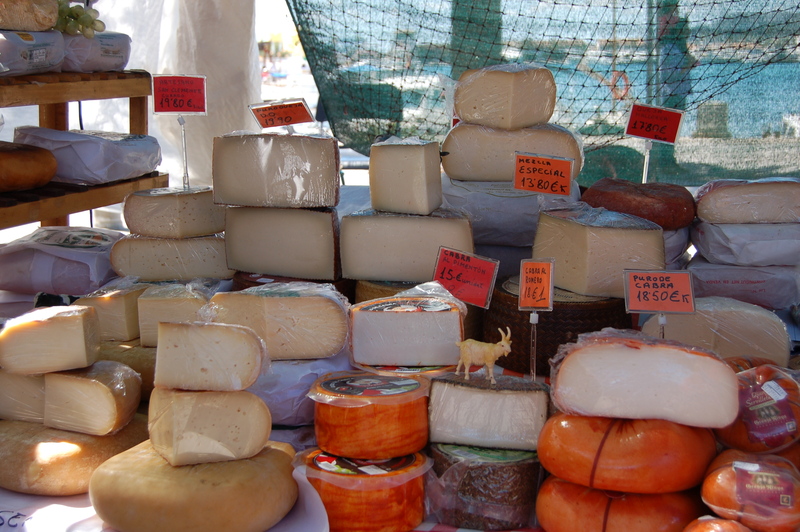 As with this type of event all over Mallorca, there are displays of dancing and handicrafts, live music, and plenty of stalls selling cheeses, preserved meats, wines, sweets and enormous rectangular cakes, sold by the portion. We resisted all temptation and kept focused on the sípia. Restaurants and cafes around the port were offering special menus, with cuttlefish as the star ingredient, but we were in search of the sípia tapas that are an important part of the fair. At the far end of port we found an enormous white marquee, crammed with people. 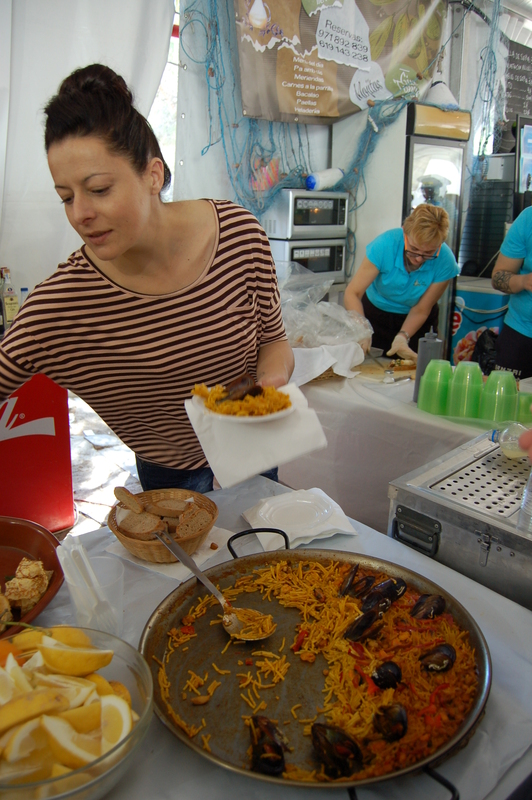 Restaurants from around the area had set up stalls to sell tapa-size portions of their own creations starring sípia. Boy, was it hot inside. We tried a sípia brochette with bacon and cheese and a fideuada amb sípia – a paella-like dish but made with tiny noodles instead of rice. Both came with a slice of baguette and were around a couple of euros a dish. Anyone for a noodle paella? It was our first visit to the Fira de la Sípia, which we’ve missed in previous years for a variety of reasons. And it was a great day out – helped, of course, by some glorious spring weather and the proximity of the glittering Mediterranean. If you’re visiting Mallorca in spring or summer, there’s every chance your visit could coincide with one of the island’s many food fairs.